As flow accumulates in gutters and spread increases, the risk of traffic accidents and delays increases. To limit this risk, drainage inlets are needed at the edge of the roadway to intercept all or a portion of the runoff and convey it to an underground storm sewer. Although there are many types and sizes of inlets in use, they are generally classified as grate, curb-opening, combination, or slotted-drain inlets. The responsibility of the designer is to determine the type, size, and spacing of inlets that cost-effectively and safely captures runoff. A grate inlet, as shown in the figure below, consists of an opening in the gutter covered by one or more, flush-mounted grates that are placed parallel to gutter flow. Vo = splash-over velocity (velocity where splash-over first occurs) (m/s, ft/s). 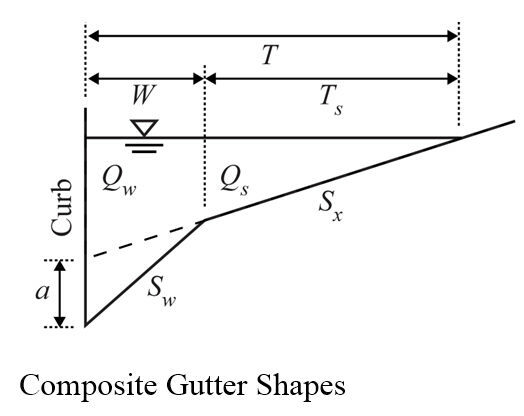 The following figure could be used to determine splash-over velocity based on grate type, length of the grate, and gutter flow velocity. L = grate length (m, ft) – The range of grate length allowed by H2OCalc is from 0.5 ft to 4.5 ft as defined in the FHWA Chart 5. 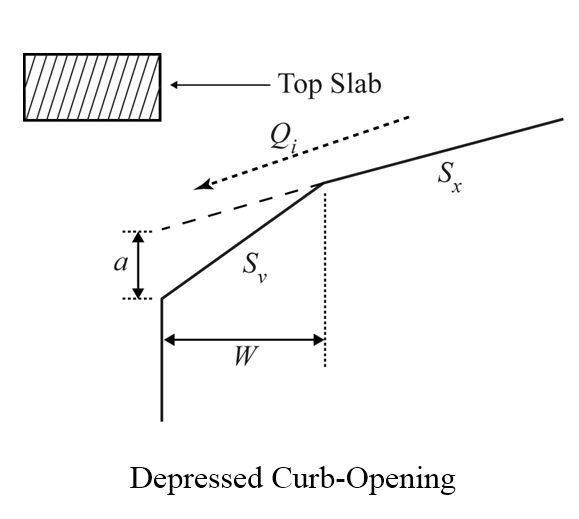 A curb-opening inlet is comprised of a vertical opening in the curb that is covered by a concrete slab, as shown in the following figure. where Ko = empirical constant (0.817 in SI, 0.6 in English). where L = curb-opening length (m, ft). Sv = cross slope of the depressed section, expressed as Sv = a/W (see the following figure). Slotted drain systems, illustrated in the figure given below, are comprised of a pipe that is cut longitudinally along its crown with bars placed perpendicular to support the opening. The hydraulic characteristics of slot inlet are similar to curb opening inlets; thus, Equations (81) and (82) are applicable. Combination inlets integrate features of both curb-opening and grate inlets (see the figure below). For equal-length combination inlets, in which the grate and vertical curb opening are of the same length, inlet capacity and interception efficiency is not significantly different from that of the grate alone. Thus, Equations 75 through 80 are generally applicable. d = depth of flow in the channel (m, ft) determined using Manning’s equation. Frontal flow efficiency, side flow efficiency, total efficiency, intercepted flow, and bypass flow are computed using the technique described previously for grate inlets. Inlets in vertical curves, or sag locations, operate as weirs at shallow ponding depths and as orifices at larger depths. At intermediate depths, flow is not well defined and may actually fluctuate between weir and orifice control. The depth at which orifice flow begins depends on grate size and bar configuration, curb opening dimensions, or the slot width of an inlet. Combination inlets, especially those of a sweeper configuration, can be effective in sag locations. In this case, the sweeper inlet can extend from both sides of the grate. Similar to on-grade computations, under weir conditions, the inlet capacity of an equal-length combination inlet is essentially equal to that of the grate alone. Under orifice conditions, the capacity increases to the sum of that of the grate (i.e., Equation 86) and that of the curb opening (i.e., Equation 89). For a conservative design, however, it is recommended that combination inlet be designed assuming complete clogging of the grate. 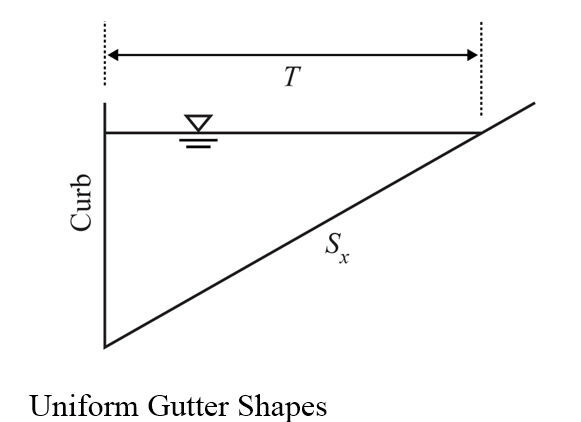 Ditch inlets in sag intercept 100 % of the gutter flow.